I’m just tickled to finally be able to post about this recipe…and the great stories that go along with it. I have started writing a regular column for Atlanta Cuisine, a sort of online foodie gathering place here in Atlanta, called Deep Dish. Every month, it’s going to be a mix of dining adventures and cooking at home. A study in what inspires what. Which came first: the restaurant or the recipe? For the first piece, I was blown away by a dish I had during a spectacular meal on vacation in St. George Island. A tasting menu at Avenue Sea in Apalachicola that rivaled any meal I’ve had here in town. 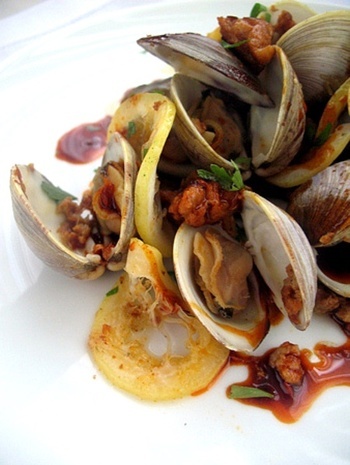 One dish stood out in particular: clams with chorizo, lemon, and paprika oil. I came home and immediately tried to replicate it – with my own little twists. You can read the entire story about how this dish came to be here at AtlantaCuisine.com. The recipe is posted at the bottom of the article in its entirety. Please feel free to leave feedback there or here on the blog – whether you’re a resident of A-town or not! Congratulations on writing for Atlanta Cuisine. There’s great information to be had there, but I don’t use the site because the design is so unfriendly. They need an RSS feed, but if it exists, I’ve never been able to find it in all the clutter — good content, but it needs a usability update. :) Fortunately, if you keep linking to your articles, I can at least read those! Thanks for all the content you produce. Yours is one of the most enjoyable Atlanta food blogs I have found! Thanks for checking out the link. I will definetely put up a directly link to the column every month on the blog – the one I’m working on right now is going to be a lot of fun! I will also show your comments to the powers that be at AC. There *is* a ton of good information there…but you’re right…sometimes tricky to get to. Wow the texture and dimensions of the clams really comes alive in the photo!